Mizuma Art Gallery is pleased to present an exhibition by AMANO Yoshitaka entitled “Tales of Spring Dreams” on Wednesday, April 10th, 2019. Amano Yoshitaka joined the animation film studio Tatsunoko Production when he was just 15 years of age. Since then, he has been involved in character designs for countless popular anime titles including Time Bokan and Science Ninja Team Gatchaman. After leaving the anime production company to work independently, the illustrations that he took major part in for Vampire Hunter D novels, and especially for the character designs in the Final Fantasy series, has made his name known on the global scale. Since the late 1990’s, Amano has moved his focus of work into fine arts, and has taken his efforts primarily abroad. From the outset of “Amano Yoshitaka exhibition: The World Beyond Your Imagination” at Contemporary Art Museum Kumamoto in 2014, he began to participate in a large-scale touring shows such as the exhibition for Japanese public institution Art Museum. Last year, he had a solo show displayed for the grand opening of Mizuma, Kips & Wada Art in New York, as well as having an enormous exhibition for the first time in China. He has set a remarkable role as one of the international creators to represent Japan. 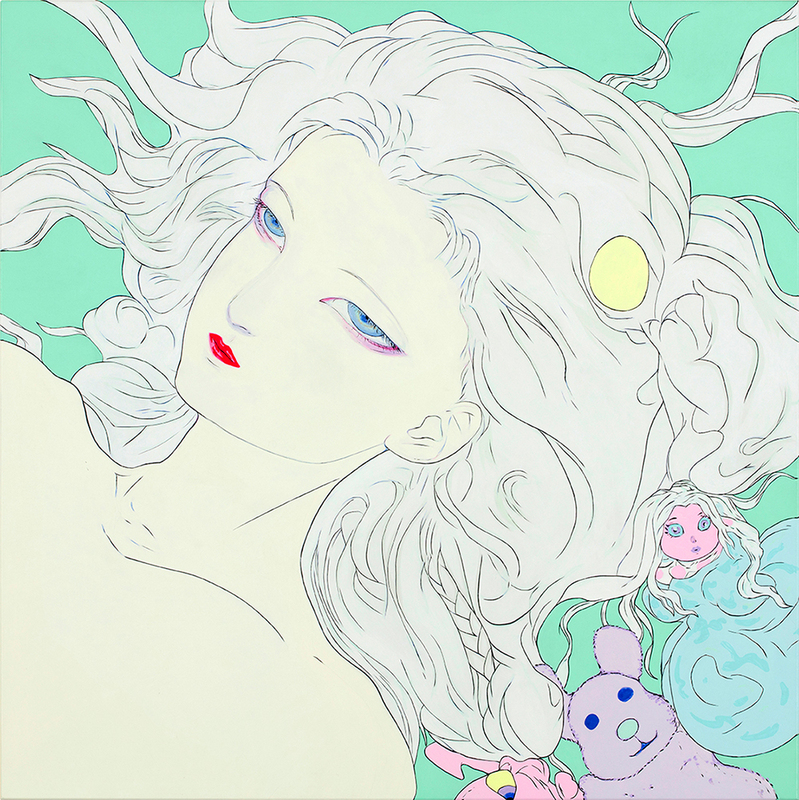 Following the present exhibition, there is a show planned by four artists including himself, which takes its theme back to the origins of Tatsunoko Production, in “Rough ∞ Drawing Exhibition” at 3331 Arts Chiyoda from April 2nd to 16th. Glimpses of bright radiance that reveals from a maturing little girl as she grows into adulthood, has always been one of the primitive sources in the collective ideal image of beauty for humanity, and has made appearances in various field of artworks, as they are depicted as a subject or used as an essential inspiration. They are ephemeral beauty like a spring dream; a fleeting allure, that connotes a feeling of an eventual passing, and that may just be the reason why people discover a bright radiance in life. The girls that Amano paints doesn’t show a moment of expression, as she calmly lays her true self down as if to accept her fate in becoming part of the world and the story. As if the tension of a long drawn winter bursts out like the overflowed water spilling over the brim of the cup, the landscape that surrounds us quickly erupts into a cheerful and lively season, and in no sparing time, reveals a brilliant transition. And this year, the chronology of Japan that has become too familiar for us all will finally change its color, revealing to each of us a one-of -a-kind spring. In this exhibition, the spring that Amano Yoshitaka draws with his various techniques, is like a single petal of story that swirls around in the changing of season and time. We look forward to welcoming you to this exhibition.